Dracarys – (“drah-KAH-ris”) From Game of Thrones written by George RR Martin – The High Valyrian word for “dragonfire”. Mother of dragons, Daenerys Targaryen, teaches her young dragons the command to breathe fire “Dracarys”. I chose Dracarys for my kennel name as an extension of my love for the genre of fantasy and medieval history as seen in the world of Game of Thrones. I grew up with hunting dogs. My father hunted and bred Labrador Retrievers. I helped him train his stud dog, and helped to whelp his puppies. It was a great way to grow up – learning responsibility and love through dogs! My heart was always drawn to Rottweilers though. They worm their way into your heart and before you know it, you’re owned. 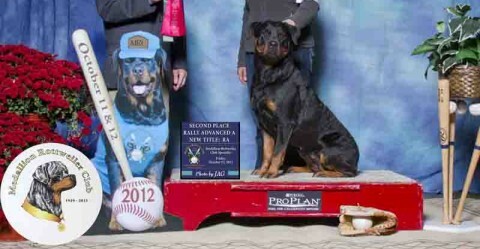 We have been blessed to have Rottweilers in our lives for over 17+ years.